Th e genuineness of Christy Lisella resonates in volumes when you hear him speak. Humbled and filled with emotion, the 91-year-old Summit Hill veteran exudes sincerity and appreciation of and for his hometown. 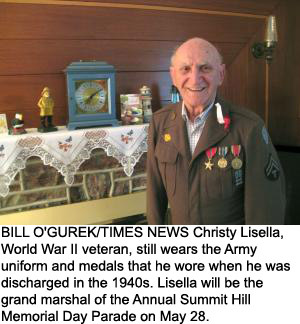 That's why Lisella's selection as grand marshal of the Annual Summit Hill Memorial Day Parade is "the perfect choice," according to Tom Vermillion, parade committee chairman, who announced Lisella will lead the line of march on Monday, May 28. The World War II veteran will ring the school bell of his alma mater, the former Summit Hill High School, at approximately 11 a.m., signaling the start of Carbon County's largest tribute to our nation. The annual memorial service held in Ludlow Park will precede the parade, starting at 10 o'clock. "Naming him (Lisella) our grand marshal was a great decision. It was unanimous from the Legion and from our side (parade committee). He's certainly deserving and he's a good guy," Vermillion said.When you ask Lisella about the honor, humility spews from him. "Oh my, gosh, I forget about it for awhile, then I think about it, and I think I explode inside. I don't know what I'm going to say. I'm pretty much excited, but it works me up inside," said Lisella. Those who know Lisella will quickly point out he is a person of sincerity who grew to be a nonagenarian while loving every minute in his hometown and church, St. Joseph Catholic Church, Summit Hill. "When we went to his home (at 50 E. Lehigh St.) to ask him if he'd be the grand marshal," Vermillion said, "I think we found the most humbled and happiest person we could find. It was a great selection." And, without question, Lisella has been the steadiest part of the traditional parade in Summit Hill for decades. His participation goes back to his discharge in the 1940s. "I believe I was in every parade that we have had since then. For about 70 years ...," said Lisella, who until a few years ago, still proudly marched in the parade with his comrades from American Legion Post 316. A "rider" since then, he is looking forward to being the guest of honor and will ride most prominently this time around. "Oh boy, I get excited and all when I think about it ... sometimes, I think I'm waiting for it to be over, but then I realize it will be a great honor," Lisella said. Christy is a son of the late Christino and Carmella (Serignese) Lisella. His father immigrated to the U.S. from Italy and operated a bar on Linden Street in Summit Hill, later working in the mines while the couple raised 11 children. A lifelong resident of Summit Hill, he recalls, "We had a great family that was close. I attribute it to my mom, who was such a wonderful woman. Times were tough then, and all of us realized it was important to live good lives and be a part of the community and our church," Christy said. Two of his siblings, John "Jack" and Marie Badowsky, join him in continuing the Lisella Family legacy. Four brothers (Frank, Louis, Richard and Vincent) and four sisters (Martha Rutch, Delina Visnosky, Donetta Pastucha and Carmella Davidyock) are deceased. Christy attended and graduated from the former St. Joseph Parochial School, Summit Hill. Upon his graduation in 1939 from the former SHHS, Christy worked for the former Fauzio Brothers in the Panther Valley mining industry. He was then drafted into the Army, going on to serve in the European and African theaters with the 636th Infantry, 36th Division, and attaining the rank of T-5 before his honorable discharge. Later, he returned to Summit Hill where he worked for the Fauzios, retiring as a power shovel operator. Like so many veterans, reluctance in talking about their war experiences appears to be the norm. For Lisella, it's pretty much the same. "I don't like to brag about where I was and what I done, but it (the war) was one helluva challenge," he said. He did recall being stationed in Southern Italy in September, 1943, for combat missions he said "were the worst part of the war." "I remember pushing my face into the grass and sand and I cried for my mother," Lisella recalled, "I told her I wouldn't be home anymore ... it was painful." Later, he did experience pleasant times there as he had the opportunity to meet his parents' families in the Village of Sepino. "It was a beautiful place and I liked being with them," he said. He remembers his late wife, the former Willa Miller of Summit Hill, who was his "grade school sweetheart," writing him a letter every day. They married upon his return home and were married for 62 years until her passing in 2008. On numerous occasions, the Lisellas returned overseas to retrace his military service and visit other countries. The couple raised two children, attorney Thomas of Tamaqua, and Jane, R.N., wife of Manuel Lanzos of White Bear, Summit Hill. Lisella has four grandchildren, Kevin Steber, Stephanie D'Souza and Krysten and Taylor Lisella; and three great-grandchildren, Kacy Steber and Gavin and Brody D'Souza.